HOFFMAN ESTATES, IL (January 24, 2019) –The Collision Repair Education Foundation (CREF) is hosting a two day career fair on March 29-30 in collaboration with the Colorado Automobile Dealers Association (CADA). Held during the Denver Auto Show at the Colorado Convention Center auto dealers and collision professionals will have a chance to present career opportunities to student training for a transportation career and other attendees. The career fair is held during the Denver Auto Show Friday March 29 from 2-7 p.m. and Saturday, March 30, from 10 a.m.-3 p.m. at the Colorado Convention Center located at 700 14th Street in Denver. During the career fair, auto show attendees and the anticipated 400+ high school and college student attendees will have the opportunity to learn about career opportunities from participating sponsors and connect with potential employers. “Partnering with CREF was an opportunity for CADA to offer Colorado’s tech students additional career choices,” said Kim Jackson, Marketing and communications Director at CADA. Career fair employers can choose one of three sponsorship tiers to showcase the various career paths available to partners, students, and families who attend the auto show. The Foundation is aiming to recruit 20 collision repair industry employers or representative companies as table sponsors. CADA is also aiming to recruit 20 table sponsors, most of which will be auto dealers. The 20 CREF and 20 CADA table sponsors will each have a 10’x10’ booth, an eight foot draped table, two chairs, electrical connections, WiFi, their company name on the passport, and a copy of the student registration list. Investment: $1,500. The four supporting sponsors will receive all the benefits of the table sponsor, plus their company logo featured on the sleeve of the student tech shirts (as long as the sponsorship is secured by February 16, 2019) and have their company logo on the passport. Investment: $3,000. The lead sponsor receives all the benefits of the table sponsor, plus their company logo featured on the front of the student tech shirts (as long as the sponsorship is secured by February 16, 2019) and have their company logo on the passport. Investment: $7,500. CREF is hosting a list of career fairs this spring, including the Chicago Spring Career fair. Hosted in conjunction with the World of Wheels/AutoRama Student Day Event, the Chicago Career Fair is another opportunity to increase awareness of collision repair industry issues, like the repair technician shortage. Student Day takes place during the Friday morning of opening weekend of World of Wheels/AutoRama event and is only open to local students. Over 700 collision and auto service students attend annually. Industry members interested in working with the Collision Repair Education Foundation in support of secondary and postsecondary collision repair students, instructors, and their school programs should contact Education Foundation Director of Development Brandon Eckenrode at Brandon.Eckenrode@ed-foundation.org or (312) 231-0258. HOFFMAN ESTATES, IL (January 10, 2019) – The application for the Collision Repair Education Foundation Benchmark Grant program, formerly the Ultimate Makeover Grant, is now available to schools teaching collision repair across the U.S. The grant program is in its 10th year. Instructors are advised to begin the application early and industry professionals are encouraged to get involved with the Benchmark grant by working with their local school’s collision instructors to help them apply. The winning schools will be announced during the SEMA show in Las Vegas, Nev. in November. Awards of up to $25,000 will be given. The school Benchmark Grant application is available online and is due by Friday, June 7, 2019. The designation will be determined by the Foundation based upon information provided by schools about the capabilities of their program detailed in the Collision Repair Education Foundation Benchmark grant application. The criteria for each level includes the number of hours of instruction, curriculum in place, along with what tools, equipment, and supplies a school uses to prepare their students for employment in the collision industry. If there is something that a school needs to advance to the next level, the Education Foundation’s grant application will allow a school to request that particular item. The goal is to help every school acquire the resources to eventually achieve a Tier 1: Advanced school designation. Schools at Tier 1 status can request support for items that further advance and expand their program. The organization’s Board of Trustees Selection Committee will select the winners of the awards and determine what items off the wish lists each school will receive. Since 2009, schools have been able to apply for the grant to get much needed tools, equipment, and supplies for their school. Over $4 million in cash and in-kind donations have been given out to schools as a result of the grant, and over 25,000 collision students have been impacted by the program. Collision repair facilities, insurance companies and suppliers interested in supporting school grants should contact Education Foundation Director of Development Brandon Eckenrode at Brandon.Eckenrode@ed-foundation.org or (312) 231-0258. HOFFMAN ESTATES, IL (December 18, 2018) – The Collision Repair Education Foundation (CREF) is facilitating a student safety kit donation program between collision repair businesses and high school and college collision repair programs. Each local student can be sponsored for $50. Businesses that sponsor 20 or more safety kits can have their corporate logo featured on a patch on the front of the uniform shirts. Participating businesses can sponsor schools of their choice, or they can choose to be paired with a school in need by the Education Foundation. The donation program can lead to long term relationships between professionals and school programs that are preparing the next generation of collision industry employees. Sponsorship and donations are facilitated through the Collision Repair Education Foundation, but sponsoring businesses are invited to visit the school to meet the students and distribute the new uniforms. Companies interested in sponsoring the uniform donation program through the Collision Repair Education Foundation for the 2018-2019 school year should contact Collision Repair Education Foundation Director of Development, Brandon Eckenrode, at Brandon.Eckenrode@ed-foundation.org or (312) 231-0258. The Collision Repair Education Foundation is seeking industry support for student safety kits to make the spring back-to-school season safer and more professional at the over 1000 schools that teach collision repair across the U.S.
Hoffman Estates, Ill. (December 13, 2018) – The Collision Repair Education Foundation (CREF) 2019 grant and scholarship application period is now open to high school and post-secondary collision students who will be attending career and technical schools and colleges in the fall. The Foundation and its industry supporters offer over $200,000 in grants and scholarships annually, as part of their mission to promote collision repair education and create quality candidates for entry level job opportunities. Application information for CREF grants and scholarships is posted on their website, at https://www.collisioneducationfoundation.org/student-scholarship-and-grant-application-2/. This year’s deadline to apply is February 14, 2019 and winners are chosen and notified by phone or mail in April and May. The Collision Repair Education Foundation aims to support collision repair educational programs, schools, and students to create qualified entry-level employees and connect them with an array of career opportunities. For more information, contact Melissa Marscin at scholarships@ed-foundation.org or 888.722.3787, Ext. 282. 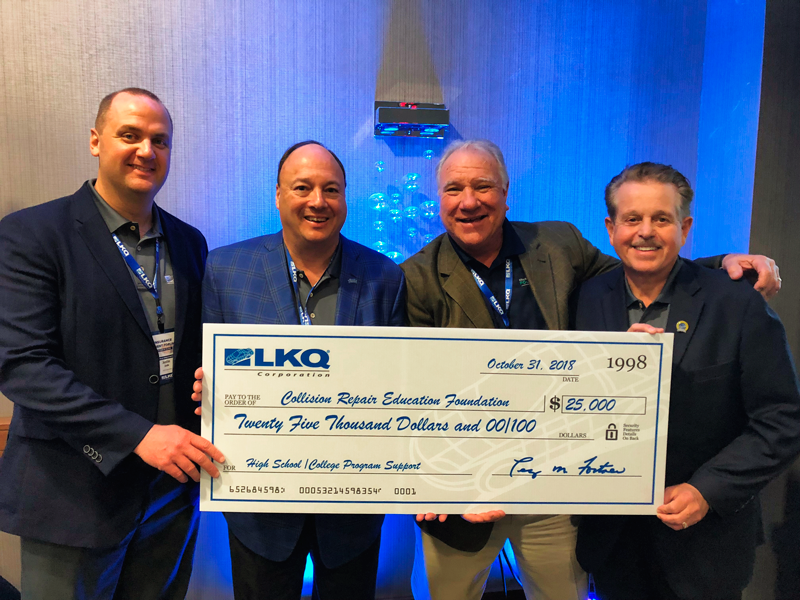 Hoffman Estates, IL – November 16, 2018 – – LKQ Corporation has renewed its $25,000 contribution to the Collision Repair Education Foundation, as part of its continuing commitment to the future of the collision industry. The financial contribution is in addition to the in-kind donation of parts that LKQ donates to collision school programs each year. The monetary contribution assists Education Foundation’s ability to offer collision school tool and equipment grants and student scholarships across the U.S.
“The shortage of collision repair and refinish technicians, combined with declining budgets at technical schools, continues to be a serious challenge for our industry. LKQ is proud to support CREF in its work to support students and schools and connect people with industry employers,” said Terry Fortner, Vice President – Insurance, Sales and Marketing for LKQ. LKQ local and regional staff is also helping promote the Foundation’s 2019 career fair schedule in local markets across the country. Suggested Caption: LKQ Corporation has continued its support of the collision industry education system with a $25,000 donation to the Collision Repair Education Foundation. Nick Zarcone, chief executive officer of LKQ (2nd from left) along with Justin Jude (left) and Terry Fortner (right) from LKQ, presented Clark Plucinski, executive director of the Foundation, with the donation in Las Vegas during the recent SEMA show. Hoffman Estates, IL – November 9, 2018 – The Collision Repair Education Foundation announced more than $500,000 Ultimate Collision Education Makeover school grants supported by donations from industry companies and local I-CAR committee fundraising activities. The announcement came during the Foundation’s annual reception held October 30 at the Renaissance Las Vegas Hotel during the 2018 SEMA Show in Las Vegas, Nev. The Ultimate Collision Education Makeover school grants announced will go to help improve 173 schools in 37 states with over 6,700 students enrolled in collision repair training programs. The Makeover grant program incorporates the Foundation’s Collision School Career Readiness Benchmark that the Foundation launched in 2016. Under the new program developed by the Foundation, schools are classified into three tiers based upon criteria including the number of hours of instruction, curriculum in place, along with what tools, equipment, and supplies a school uses to prepare their students for employment in the collision industry. The grants awarded will assist schools to advance to the next tier, or to allow top tier schools to further expand their program’s capabilities. Collision repair facilities, insurance companies and suppliers interested in supporting school grants should contact Education Foundation Director of Development Brandon Eckenrode at (312) 231-0258.